Working breakfast with Angela Merkel and Emmanuel Macron. 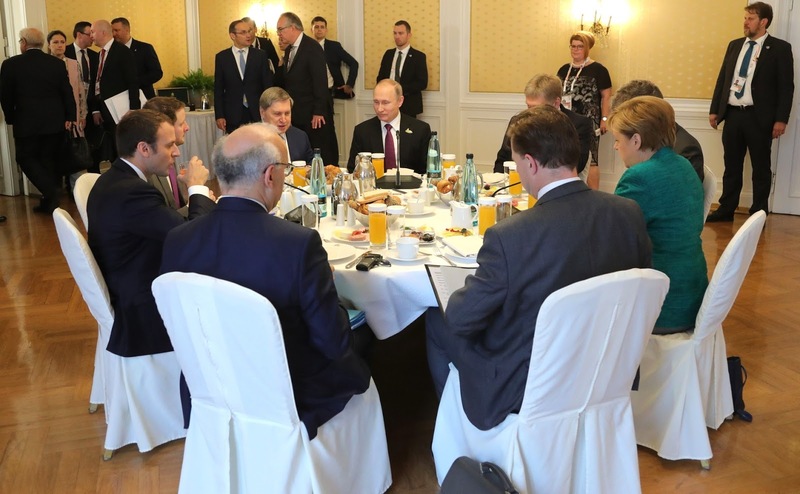 Vladimir Putin had a working breakfast with Federal Chancellor of Germany Angela Merkel and President of France Emmanuel Macron. 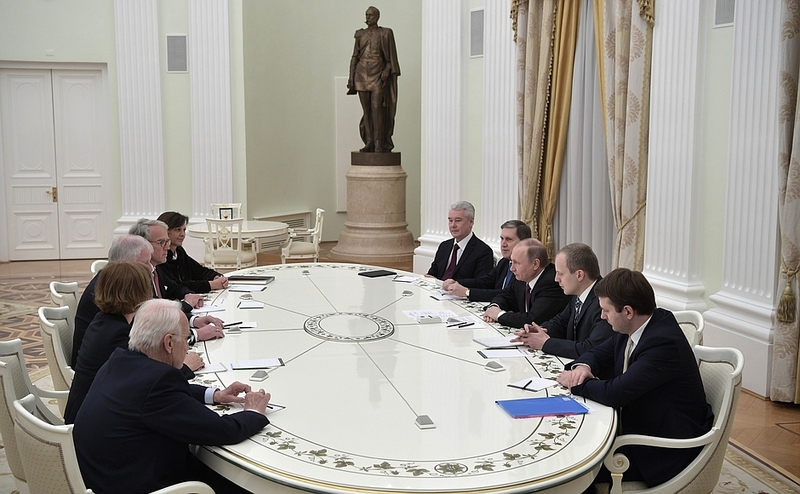 The leaders discussed the situation in Ukraine and ways to settle the crisis. 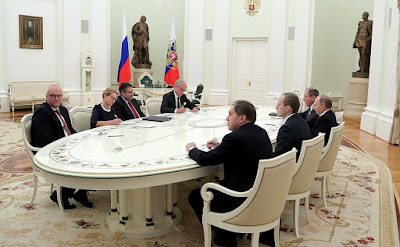 Deputy Chief of the Presidential Executive Office, Presidential Press Secretary Dmitry Peskov. 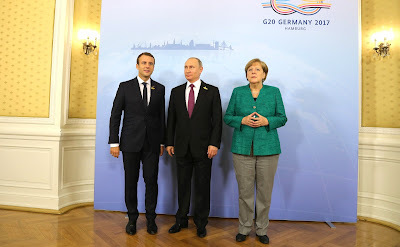 Vladimir Putin with Federal Chancellor of Germany Angela Merkel and President of France Emmanuel Macron before a working breakfast. 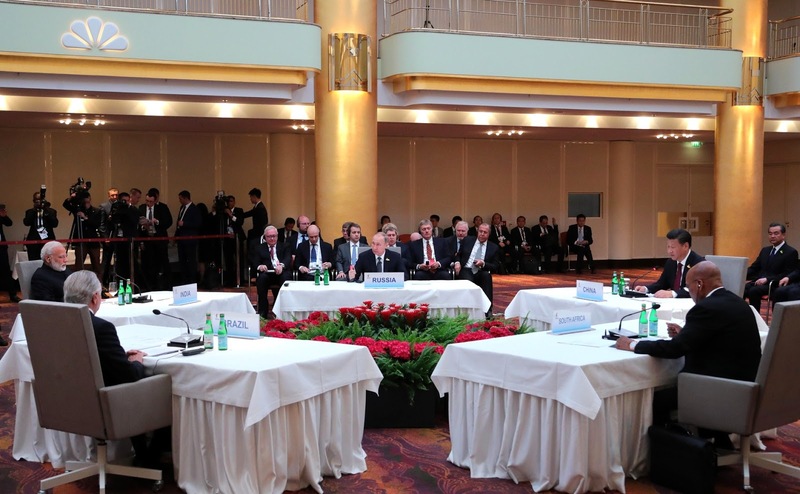 The G20 leaders held an informal meeting on counter-terrorism efforts. In addition, Vladimir Putin will take part in two working meetings devoted, in particular, to global economic growth, trade, climate change and energy. 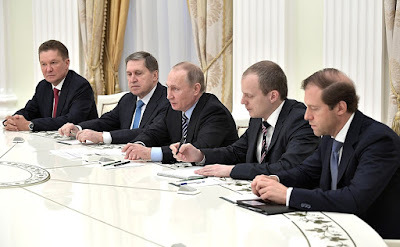 The President of Russia is also expected to hold a number of bilateral meetings on the sidelines of the summit. 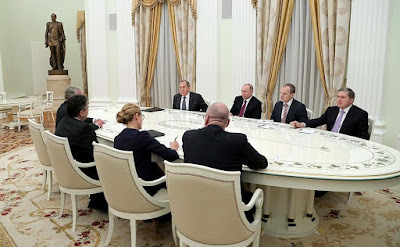 Informal meeting of the G20 Leaders. Angela Merkel. Donald J. Trump. Informal meeting of the G20 Leaders. Vladimir Putin with Federal Chancellor of Germany Angela Merkel before the start of the G20 summit. Vladimir Putin with President of South African Republic Jacob Zuma (left) and President of Mexico Enrique Pena Nieto. Vladimir Putin with Foreign Minister Sergei Lavrov before the start of the G20 summit. 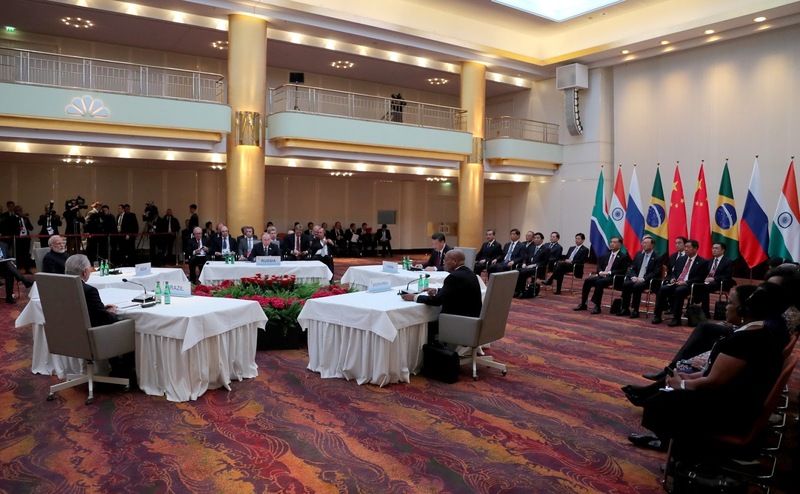 Informal meeting of BRICS heads of state and government. Press Communique of the BRICS Leaders Informal Meeting on the Margins of the G20 Hamburg Summit. We express appreciation and voice full support for China’s BRICS Chairmanship. We look forward to a successful hosting of 9th BRICS Summit in Xiamen under the theme of ”Stronger Partnership for a Brighter Future“. President of Brazil Michel Temer at the informal meeting of BRICS heads of state and government. 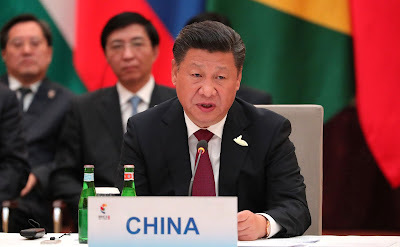 President of the People’s Republic of China Xi Jinping at the informal meeting of BRICS heads of state and government. 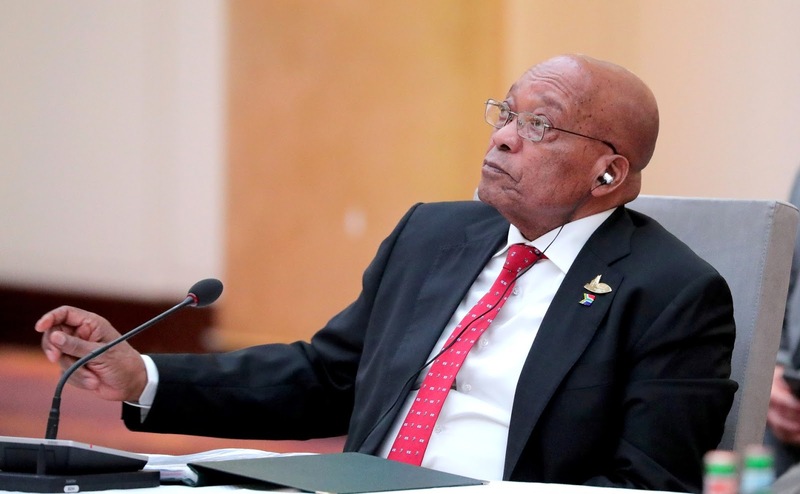 President of South Africa Jacob Zuma at the informal meeting of BRICS heads of state and government. 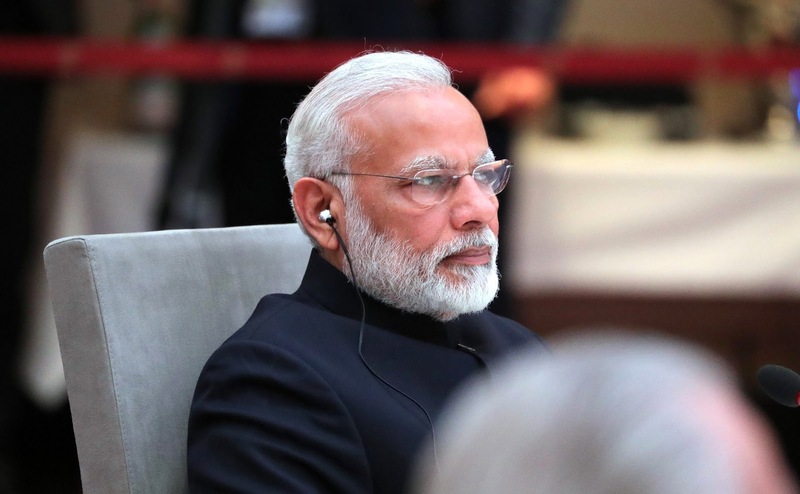 Prime Minister of India Narendra Modi at the informal meeting of BRICS heads of state and government. Vladimir Putin at the informal meeting of BRICS heads of state and government. 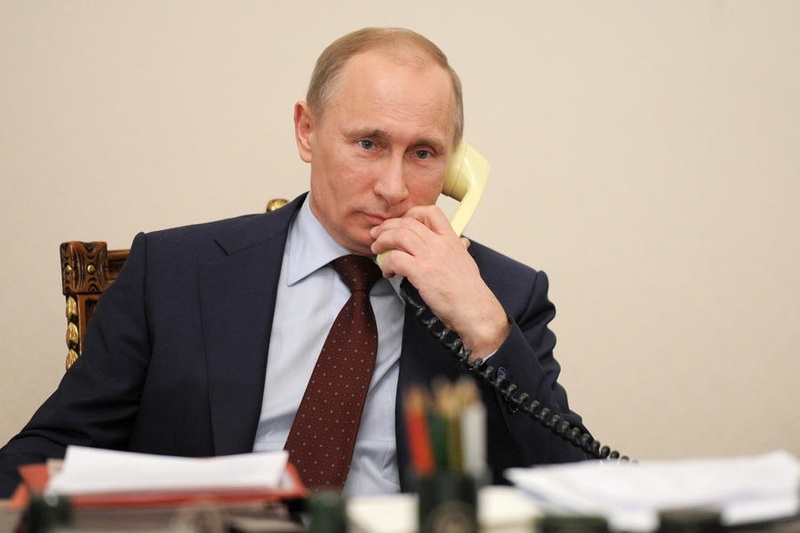 Vladimir Putin wrote an article for Handelsblatt. 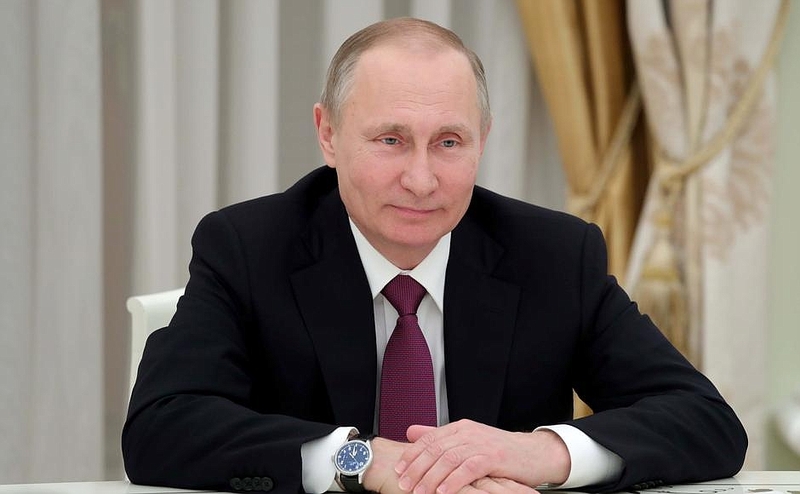 Article by Vladimir Putin published in the German business newspaper Handelsblatt. Ahead of my trip to Germany to take part in the Summit of the Group of Twenty, I would like to share some thoughts about cooperation within the G20 framework with the readers of Handelsblatt, one of the most popular and reputable German newspapers. Over the years of its existence, the Group of Twenty has established itself as an important mechanism for aligning the interests and positions of the world’s leading economies. 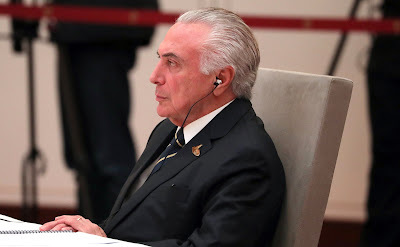 By taking coordinated action, the G20 contributed to the adoption of necessary measures that not only helped overcome the financial and economic crisis, but also laid the foundation for improving global governance, which has found itself in dire straits for a number of reasons. Importantly, by working together we have been able to find solutions to a number of long-standing issues. For instance, Russia highly values practical steps to counter base erosion and profit shifting to so-called ‘safe havens.’ All economies suffer from such practices. Irresponsible corporate behavior of this kind affects the quality of life of millions of people, resulting in high social costs. Implementation of the financial regulation reform is another achievement of the G20. For example, special regulations for those banks whose bankruptcy would be undesirable or too risky because of their size. For the first time in history, supervision bodies started monitoring transactions in the non-bank, “shadow” financial sector. Decisions regarding the key attributes for preventing and overcoming bank sector crises, organizing the work of deposit security agencies and a number of other initiatives have had a major impact. Of course, the creation of the Financial Stability Board (FSB) was a major step forward. On the back of its efforts, financial regulation reform took on a system-wide dimension and became routine, while the FSB established itself as an important partner of the IMF in its regular risk assessment studies. The FSB’s creation led to the emergence of similar structures on the national level. Even against the backdrop of growing geopolitical risks and uncertainty, the G20 has not become less efficient as a global governance tool. This is largely attributable to the exceptional responsibility demonstrated by its presiding countries in fulfilling their mission. 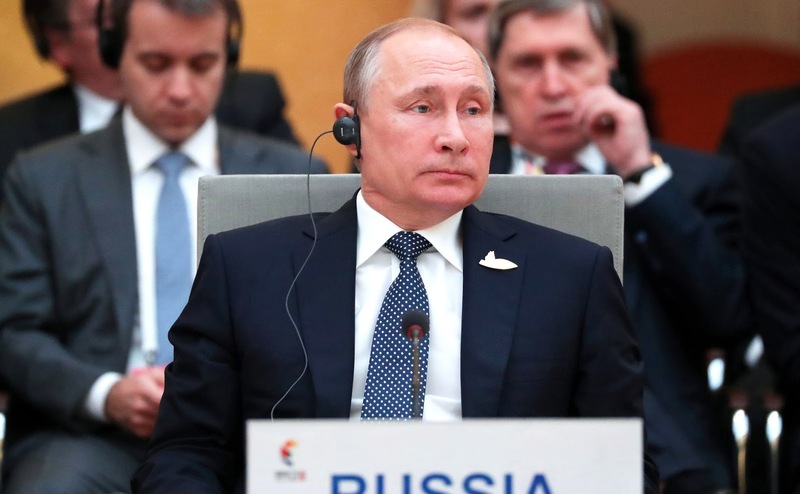 I am saying this based, among other things, on Russia’s own experience, since our country chaired the Group of Twenty in 2013, and benefited from substantial support and encouragement from all of its partners. The success of the G20 is based on respect for the opinions and position of each member, regardless of the size of its economy and its place in the international monetary and financial system. Constructive discussions and the search for compromise have become the signature style of the G20, the unwritten law of relations, which its current President – Germany – is also putting into practice. The upcoming meeting of the G20 in Hamburg is an opportunity to discuss key issues on the global agenda. We share the priorities of Germany’s Presidency and we are ready to help implement them, provided this continuity is maintained. We welcome the decision to expand the agenda addressed by the G20 to include sustainable development, climate change, countering terrorism and corruption, healthcare, migration and refugees. It is very important that the Group is giving more attention to the digital economy as a growth driver and a new factor of global governance thanks to China’s Presidency in 2016 and Germany’s Presidency this year. We are facing several major challenges. The old economic models have all but exhausted their possibilities. Protectionism is becoming the norm, while unilateral, politically motivated restrictions on trade and investment, as well as technology transfer, are nothing but masked protectionism. We believe that these sanctions are not only doomed to fail, but also run counter to the G20 principles of cooperation in the interests of all countries. I am confident that only open trade based on common norms and standards can stimulate global economic growth and the gradual improvement of interstate relations. Just as it is set forth in the fundamental principles of the World Trade Organization's activities. Russia has exceeded its commitments under the Kyoto Protocol. In other words, we have compensated the growing emission in other countries and regions. We view the Paris Agreement of April 2016 as a reliable international legal framework for a lasting climate settlement and intend to do our best to facilitate its implementation. 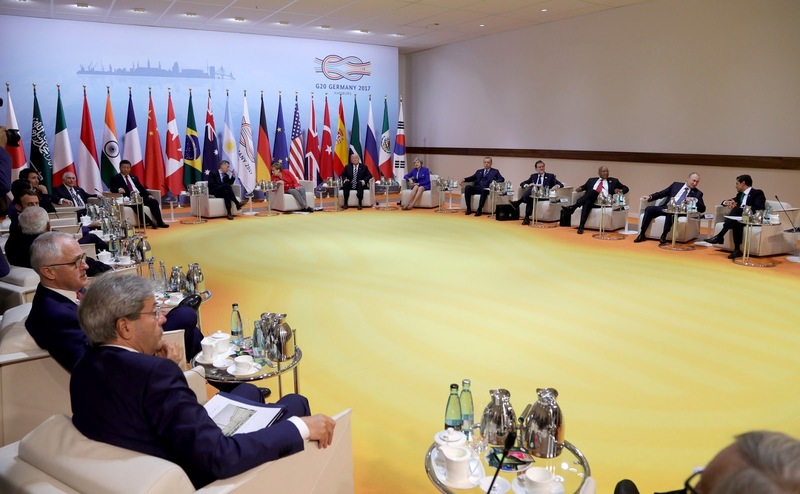 Over the past few years, the G20 has been working on the issue of migration. According to the UN, in 2017 labor migrants will remit over $500 billion to developing countries. This is three times more than the volume of official development assistance or foreign direct investment. 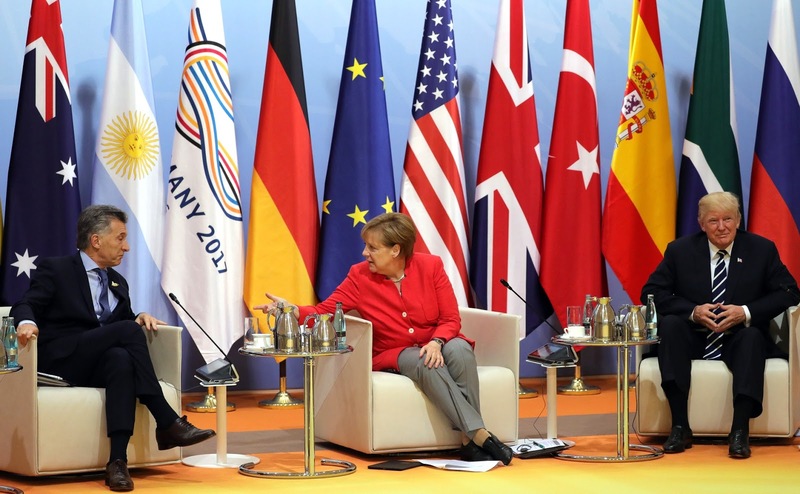 The G20 has been working on issues related to the migrants’ integration in the host countries’ labor markets, as well as their cultural adaptation and social protection. 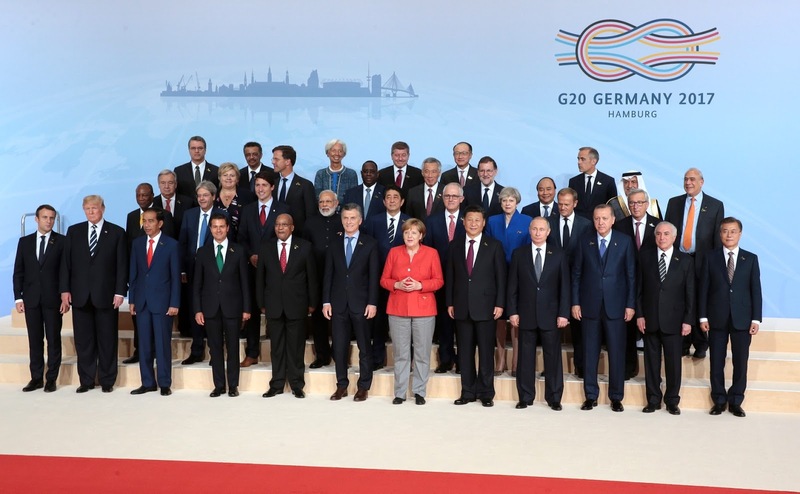 In addition, the G20 has formulated decisions this year that could help settle the issue of forced displacement. They are based on the strengthening of regional and global stability and the economic growth of the countries that are generating the unprecedented numbers of refugees. 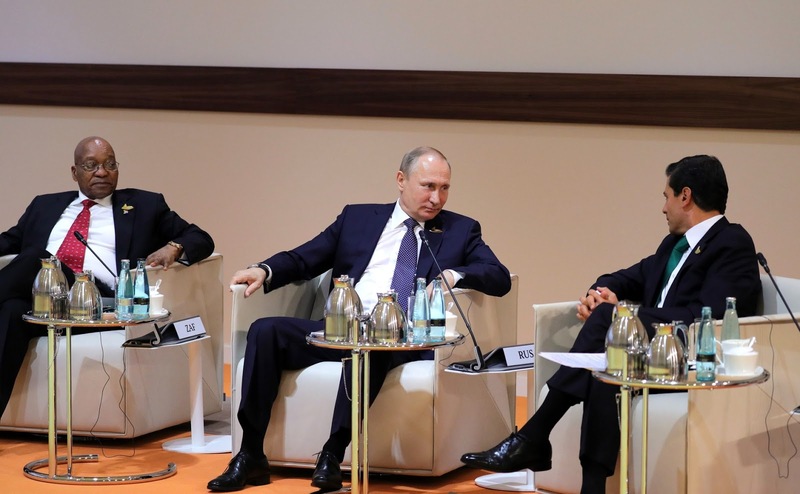 Security of and in the use of ICTs is a new issue on the G20 agenda. 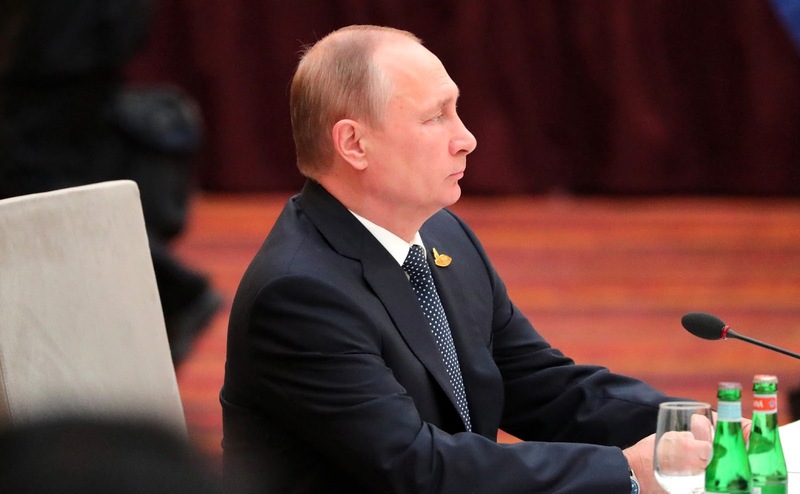 Russia consistently advocates free access to communication technologies, including the Internet. We consider it highly important to protect human rights in the information space. At the same time, freedom in the digital sphere, just like in any other, should by no means be replaced by permissiveness and impunity. This leads to a rampage involving cyber-criminals, hacker groups and all those who encroach on the privacy of individuals or the sovereignty of states by using cutting-edge technologies. Russia, which was among the first countries to note the danger of this challenge, has for several years been advocating the conclusion of universal international agreements under the UN auspices that are called on to combat these negative phenomena. We hope this will evoke a positive and interested response from other countries. The G20 agenda should also include digital literacy issues, a key element of protecting consumer rights in e-commerce. I would like to note that various opportunities opened up by the digital economy and a switchover to new industrial and technological patterns simultaneously increase the gap in the development levels between rich and poor countries and aggravate inequality between various social strata. Therefore, our efforts should focus on people, their interests and concerns. I consider this to be a key-priority for G20 activities. Obviously, the G20 can make a weighty contribution to strengthening the stability of the global economy and to maintaining its balanced development. Only by acting together and pooling our efforts can we overcome the current imbalances, ensure sustainable growth, develop fair trade and competition rules, reduce poverty and resolve acute social issues. The Russian delegation will be actively involved in the work of the Hamburg summit, which I am sure will be highly productive. I wish our German colleagues every success in organising the summit. And, of course, we will team up with our G20 partners in implementing the agreements that will be reached at the meeting. In conclusion, I would like to wish all Handelsblatt readers and all Germans health and prosperity. 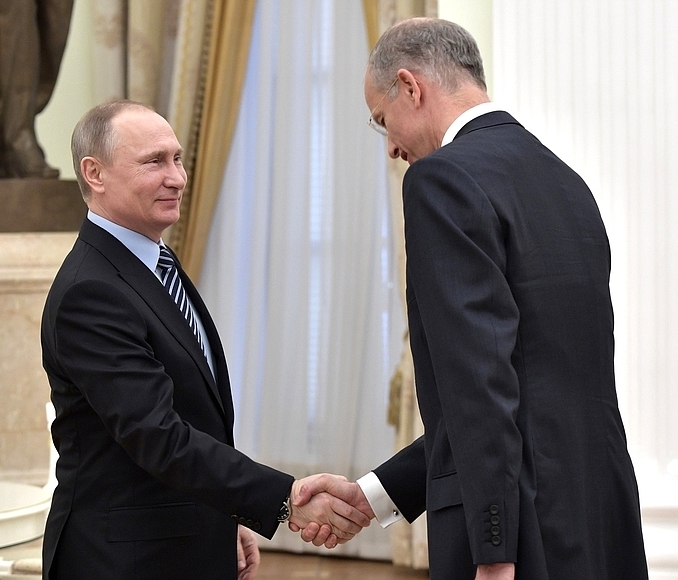 Vladimir Putin with BASF President and CEO Kurt Bock. 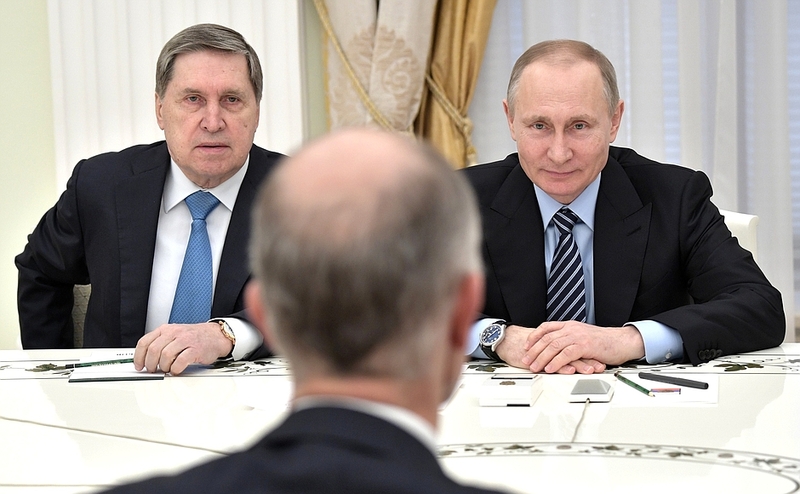 Mr. President, colleagues, let me wish you a warm welcome to Moscow. But we do not lose hope that we will be able to restore full-format cooperation. Of course, we will continue to work hard on this with our economic partners, and with our partners at the political level. On May 2, as you know, we are expecting Federal Chancellor Ms. Merkel’s visit. Mr. President, thank you very much for giving me and my colleague on the board, Hans-Ulrich Engel, the chance to be here today and say a few words. Russian President at a meeting with BASF CEO Kurt Bock. Left: Presidential Aide Yuru Ushakov. 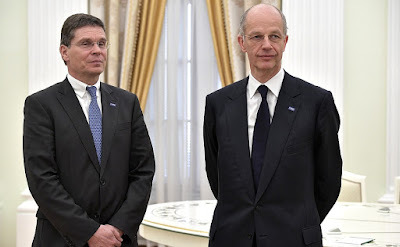 BASF President and CEO Kurt Bock (left) and BASF Chief Financial Officer Hans-Ulrich Engel. BASF President and CEO Kurt Bock (right) and BASF Chief Financial Officer Hans-Ulrich Engel. 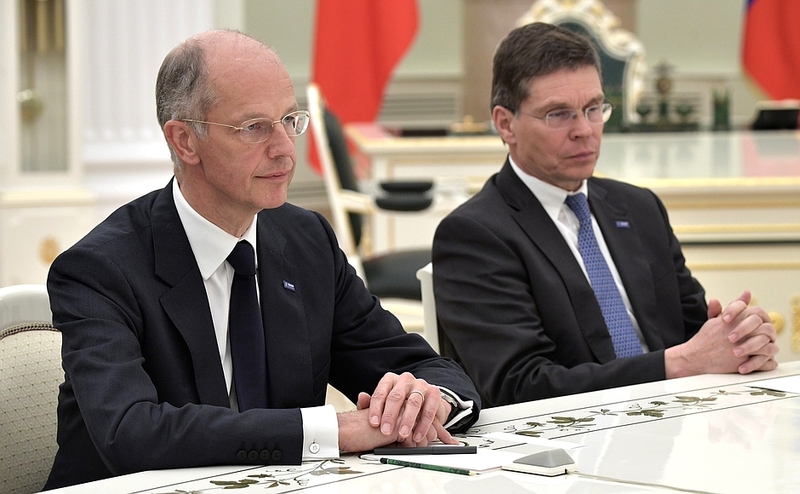 Meeting with President and CEO of BASF Kurt Bock in the Kremlin. Putin met with President of Bavaria Horst Seehofer. 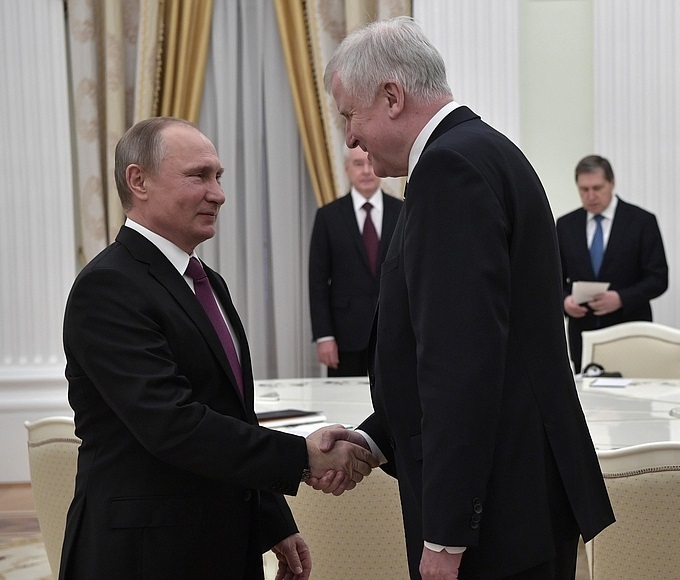 Vladimir Putin with Minister-President of Bavaria Horst Seehofer. Mr. Minister-President, colleagues, friends, please accept my heartfelt greetings. 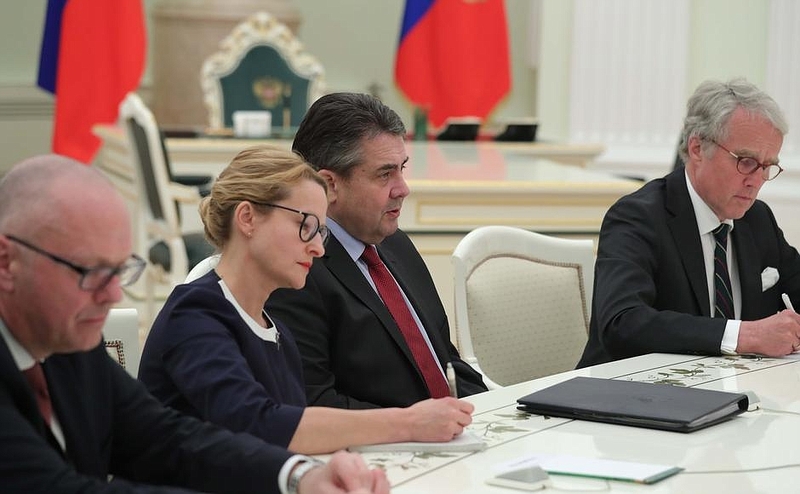 Bavaria unquestionably ranks first among the Federal Republic’s states in terms of trade and economic ties with Russia. However, what is especially interesting and unexpected is that Bavaria’s exports to Russia increased by 4 percent last year (while imports from the other states and from Germany as a whole decreased by 4.8 percent overall). You must take some credit for this, Mr. Minister-President. I hope that your visit will benefit our relations. Mr. President, thank you very much for this chance to meet, and thank you very much for your invitation. Let me assure you that we consider it our duty to expand and deepen the good relations we have in science, culture, the economy, and agriculture. Tomorrow, we will finalize an agreement with the Economy Minister (he is incredibly young). The same goes for agreements we will sign in the areas of agriculture, culture and science. Thank you. Please pass on my best wishes to the Federal Chancellor as well. We look forward to Ms. Merkel’s visit on May 2. 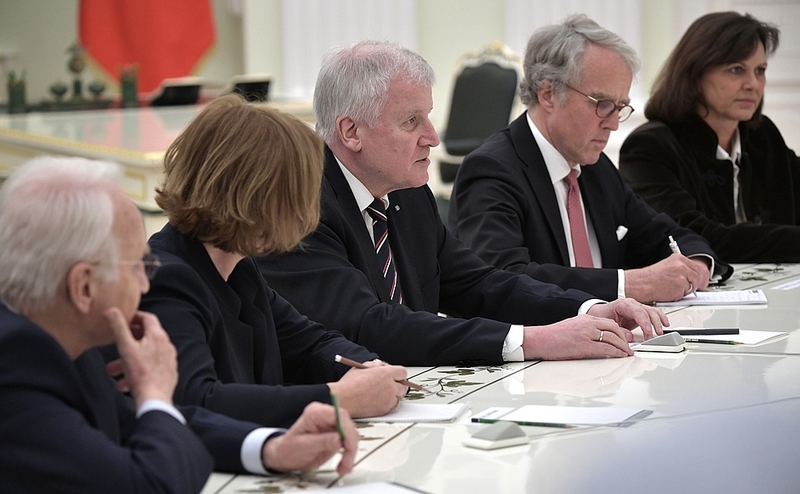 Meeting with Minister-President of Bavaria Horst Seehofer. Moscow Mayor Sergei Sobyanin and Presidential Aide Yury Ushakov (right) at a meeting with Minister-President of Bavaria Horst Seehofer. At a meeting with Minister-President of Bavaria Horst Seehofer. 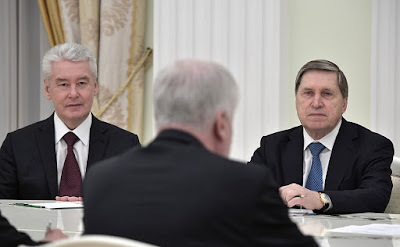 With Presidential Aide Yury Ushakov (left). 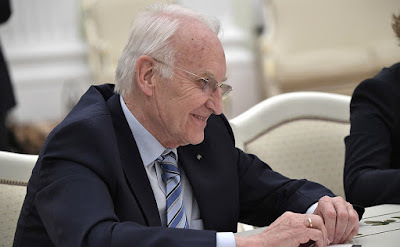 Formed Minister-President of Bavaria Edmund Stoiber. Minister-President of Bavaria Horst Seehofer. 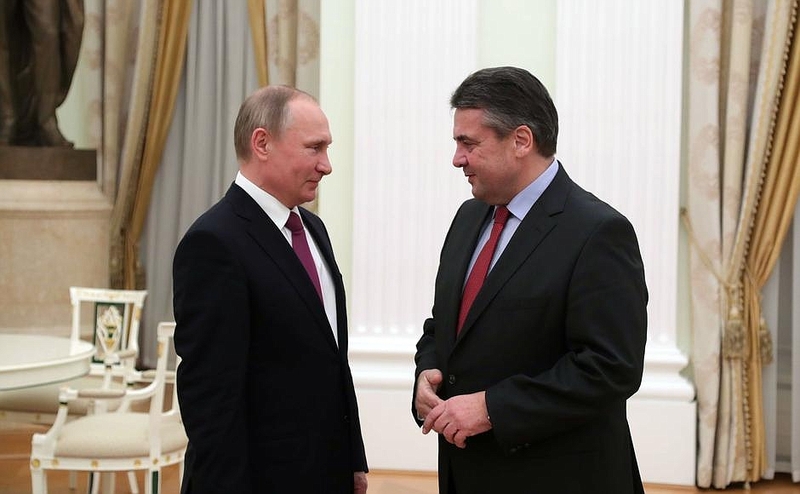 Vladimir Putin met with Minister of Foreign Affairs and Vice Chancellor of Germany Sigmar Gabriel. 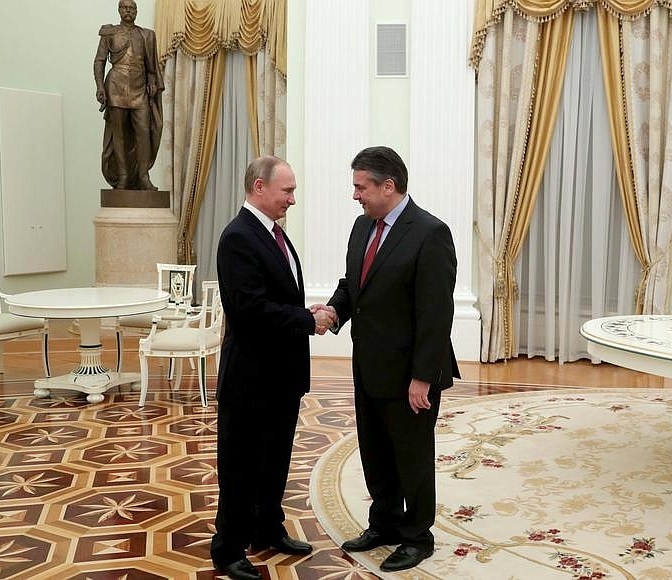 President Putin with Minister of Foreign Affairs and Vice Chancellor of Germany Sigmar Gabriel. 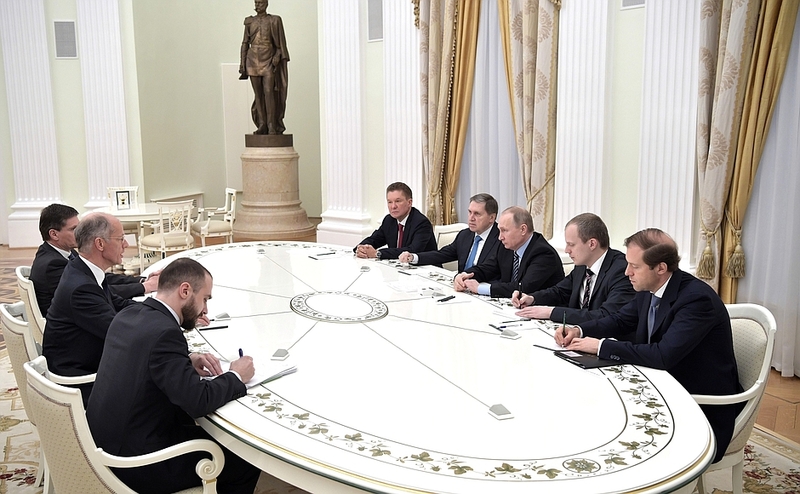 The current state of bilateral relations and prospects for their development was the subject of discussion. Russian Foreign Minister Sergei Lavrov also took part in the meeting. Mr. Minister, colleagues, let me wish you a warm welcome. We have regular, ongoing contact, and I hope that this will continue. We are aware of the situation today and the state of our relations. As I see it, our common task is to return our relations to normal and resolve all difficulties encountered on the way. I hope very much to discuss in detail with you today our bilateral relations and the tasks that we can resolve only if many countries pool their efforts. We look forward to a visit by the Federal Chancellor [Angela Merkel]. I ask you to pass on to her my very best wishes. It is wonderful that you found the time for this exchange and dialogue. 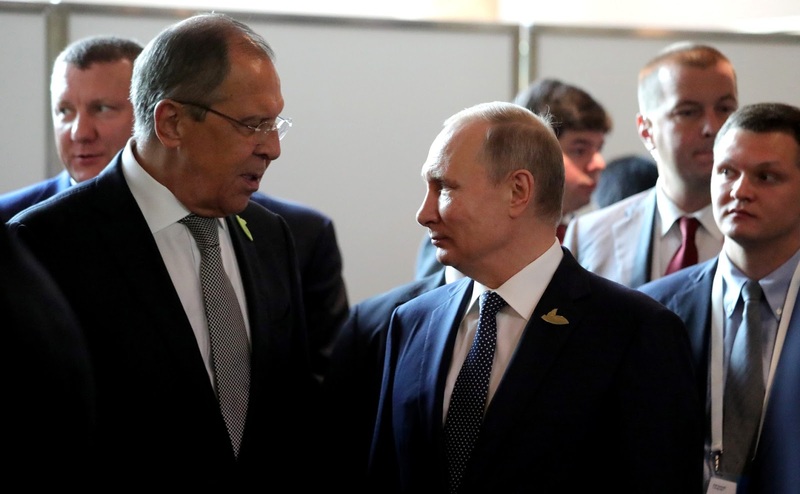 I already had a substantial discussion on various subjects with Sergei Lavrov today. I also think, and you are quite right, that despite the various difficulties before us, we do have the task of ensuring peace and stability in Europe. This is not easy, but it is something that is worth the effort. It is with pleasure that I will pass on your best wishes to the Federal Chancellor, and I too hope that the opportunity will come up for her visit. 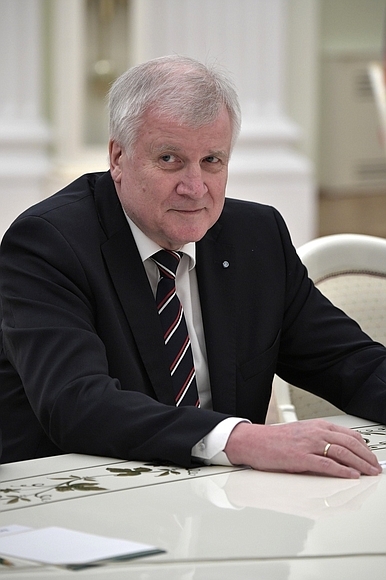 I think that the Federal President [President-elect Frank-Walter Steinmeier] also plans to visit. We therefore have every reason to be confident in our bilateral relations’ stability. We would be happy to see Mr Steinmeier too. We have very good relations with him dating from his time as Germany’s foreign minister. Vladimir Putin and Minister of Foreign Affairs and Vice Chancellor of Germany Sigmar Gabriel. Meeting with Minister of Foreign Affairs and Vice Chancellor of Germany. 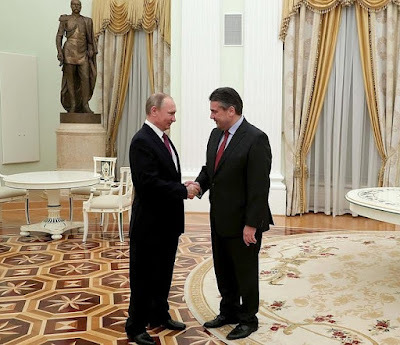 Russian President with German Minister of Foreign Affairs Sigmar Gabriel. Minister of Foreign Affairs and Vice Chancellor of Germany Sigmar Gabriel (centre). Putin's conversation with German Chancellor Angela Merkel. 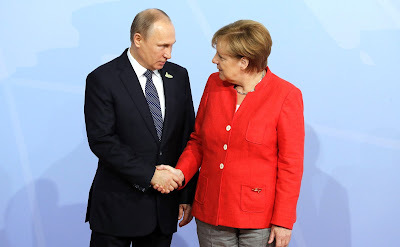 Vladimir Putin drew Angela Merkel’s attention to the data of the OSCE Special Monitoring Mission as well as statements by official Kiev representatives, which indicate attempts by the Ukrainian security forces to change the situation at the contact line in their favour by military means. 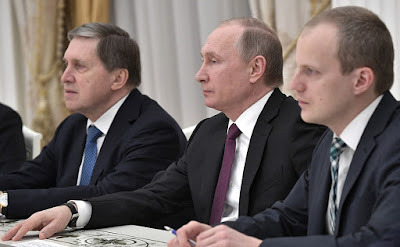 It is becoming obvious that Kiev officials are trying to sabotage the execution of the Minsk Agreements and use the Normandy format to conceal their destructive acts.